Our final full day in Australia was booked up with the second part of our Reef and Rainforests Tour with Dive Down Under. After the previous day’s underwater exertion and extra intake of oxygen we all slept like logs and were grateful for the tour operating a hotel pickup – which saved us the 30min walk back to the main terminal. The world’s most cramped 25 seater tour bus rolled in on time and we struggled aboard, trying in vain to get comfortable in the smallest legroom imaginable. 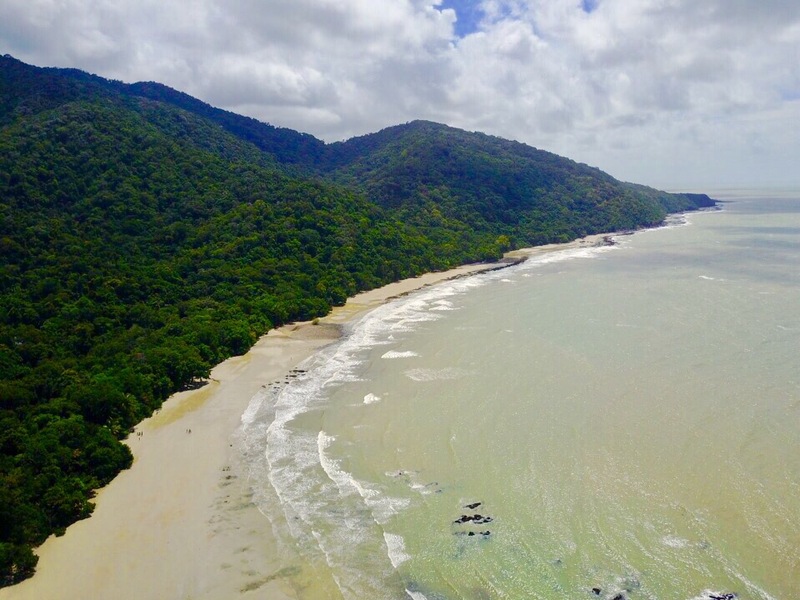 The Rainforest Tour billed itself as a day out to Cape Tribulation, Daintree River and Mossman Gorge Rainforest but we soon realised we’d been short changed. The ‘deal’ on the two day package meant that by scuba diving on day one, all the value of entrance to the animal park and steak lunch were stripped out of day two. At the first stop, while the other members of the tour went into the Habitat park to play with cute and cuddly animals, we drove the 10mins to the quaint colonial town of Port Douglas where we spent our enforced 40mins isolation eating an overpriced breakfast. Having collected the remainder of the group we proceeded to Mossman Gorge, the oldest tropical rainforest in the world. We wandered around the raised boardwalks at pace, stopping along the way for a couple of photos at the river and local fauna. From the rainforests we jump back into the bus from hell for another hours ride to Cape Tribulation. What was supposed to have been 2hrs on the beach and lunch was in fact only 70mins on a muddy stretch of mangrove beach for us – although the views of the point were impressive. With dry land in short supply we built a makeshift launch pad and sent the drone up over the beach and forest. 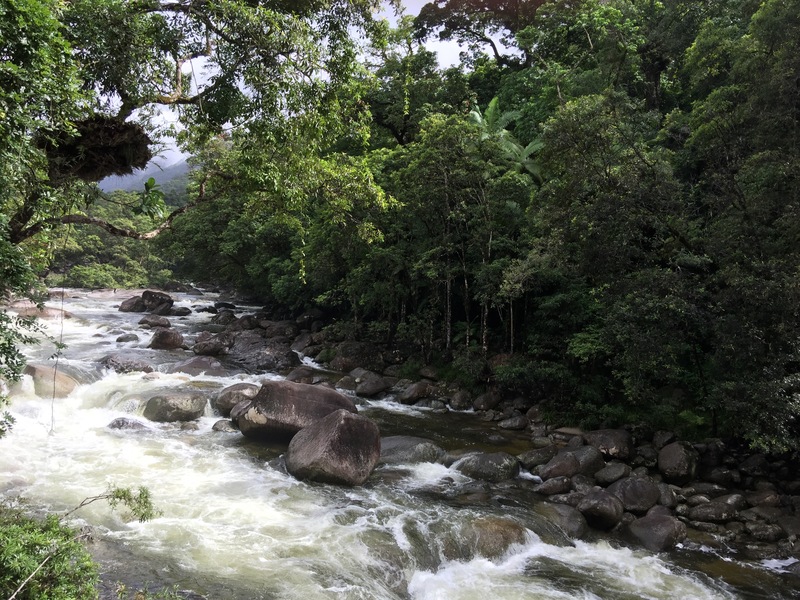 Like the rest of the tour, everything was a rush and we were soon back on the bus and headed to another viewing point before heading to the Daintree River for some crocodile watching. We climbed aboard a slightly rickety looking boat and crazy skipper which was loaded up with tourists. 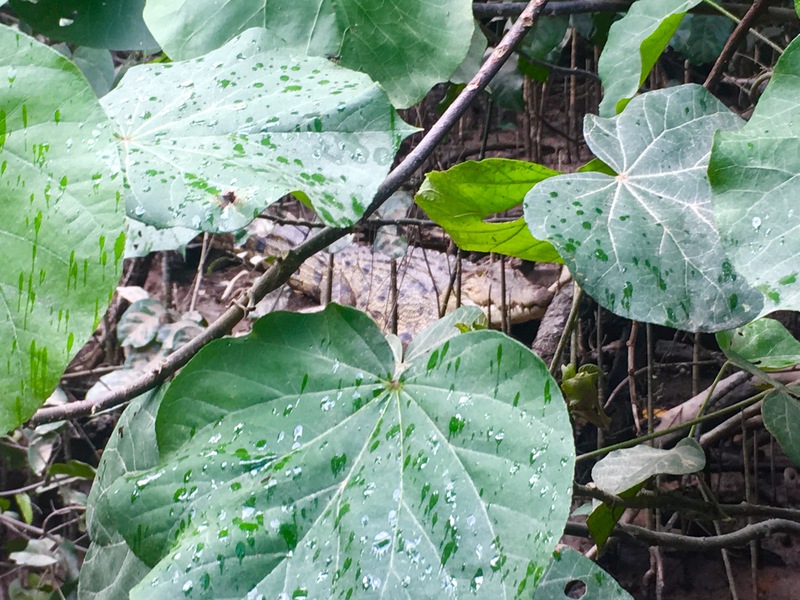 The 5km section of the river which we covered was home to only about 12 adult crocodiles – with only 1% of hatchlings making it to maturity, so eyes were peeled. Clearly the crazy skipper had been doing this a while as within minutes we’d pulled up along the river bank where a small one year old was sleeping in the sunshine. A few minutes later and we stopped in a mangrove next to ‘Scooter’, a 3m long mature male who was happily hiding from the tourists in amongst the mangrove roots – cue everyone rushing to the other side of the boat for photos and it listing…not somewhere you’d want to fall in! The rest of the boat ride was uneventful as we navigated back up stream through an increasingly heavy rain shower. Once on shore in to was back onboard the bus for the final hour back to our hotel – the bonus of being in north Cairns was we were the first people off. After a long dull day cooped up in the best we thought it would be a chance for a quick swim – alas the pool wasn’t heated so we got wet and got straight out again. With Sam having a 30hr flight the next day and Mike and Jamie over budget, the unanimous consensus was for an early night – leftovers for dinner and packing and sleep.